We’ve read the previous two books in this series and I was happy to revisit the series for our October read. It centres around 10 year old Dido, she wakes up from a ten month coma aboard a whaling ship. When Dido feels better, she is asked by Captain Casket to make friends with his daughter who refuses to leave her cabin. Dido teaches the daughter, Pen, to let go and have fun. Eventually, Pen becomes confident to leave the cabin and have some adventures with Dido. Captain Casket is on a mission to find a pink whale. He leaves Dido and Pen with Aunt Tribulation whilst he searches for the pink whale. Aunt Tribulation is pretty awful forcing the girls to do chores and wait on her. Dido teaches Pen to stand up for herself against Aunt Tribulation! This series has some fabulous characters and there’s a lot of characters to explore. I think young children will enjoy the main character, Dido. She’s brave and forward. She’s a little bit cocky, but in a loveable way. I wasn’t a massive fan of this book although I can definitely appreciate that most children will enjoy the adventure. I just wasn’t sold on the moments on the ship. It didn’t capture my attention as much as the previous books have. I felt like it was very over the top and whilst I recognise that this series is a little over the top, I didn’t connect with the story as much as I have in the other two books. 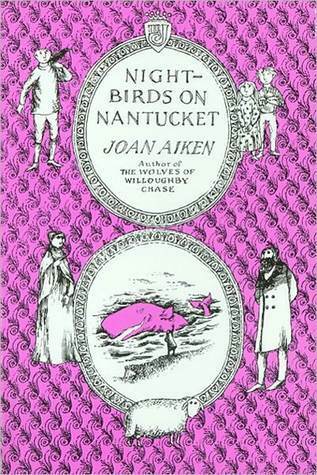 That being said, Nightbirds on Nantucket is an adventurous, quick read. I don’t think you necessarily need to have read the previous two books to read this one. You can step into the story and enjoy. For Beth’s wonderful review, please check out her blog HERE. Fab review! A shame this one didn’t convince you as much as the first two books.